Mr. and Mrs. John Henshaw are leaving for Kansas....Mrs. Henshaw was formerly Miss Lizzie Smith, daughter of Barclay Smith, east of town. Henshaw, John, head-of-household, age 37, born June 1862 in Kansas; father born in North Carolina; mother born in Indiana; married 6 years; occupation: farmer; owned farm (free). Henshaw, Elizabeth, wife, age 30, born Nov 1869 in Ohio; parents born in Ohio; married 6 years; 2 children, 2 living. Henshaw, Howard B., son, age 4, born May 1896 in Kansas; father born in Kansas; mother born in Ohio. Henshaw, Bertha A., daughter, age 2, born Oct 1897 in Kansas; father born in Kansas; mother born in Ohio. 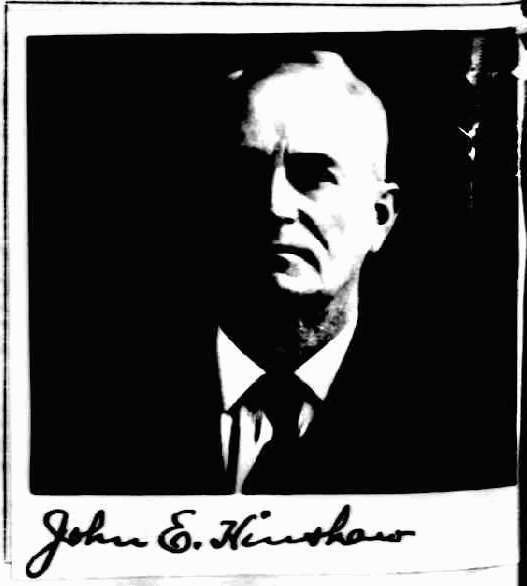 Hinshaw, John E., head-of-household, age 47, born in Kansas; father born in North Carolina; mother born in Indiana; first marriage, married 16 years; occupation: farmer, small farm; owned farm (free). Hinshaw, Elizabeth B., wife, age 40, born in Ohio; parents born in Ohio; first marriage, married 16 years; 6 children, 6 living. Hinshaw, Howard B., son, age 14, born in Kansas; father born in Kansas; mother born in Ohio; attended school. Hinshaw, Bertha A., daughter, age 12, born in Kansas; father born in Kansas; mother born in Ohio; attended school. Hinshaw, Elba Mabel, daughter, age 9, born in Kansas; father born in Kansas; mother born in Ohio; attended school. Hinshaw, Lena N., daughter, age 7, born in Kansas; father born in Kansas; mother born in Ohio; attended school. Hinshaw, Arthur E., son, age 5, born in Kansas; father born in Kansas; mother born in Ohio. Hinshaw, Edwin A., son, age 2, born in Kansas; father born in Kansas; mother born in Ohio. Hinshaw, John E., head-of-household, age 57, born in Kansas; parents born in Indiana; owned home; occupation: farmer, general farm. Hinshaw, Elizabeth B., wife, age 50, born in Ohio; parents born in Ohio. Hinshaw, Bertha A., daughter, age 22, born in Kansas; father born in Kansas; mother born in Ohio; occupation: servant, private family. Hinshaw, Elba M., daughter, age 19, born in Kansas; father born in Kansas; mother born in Ohio; attended school. Hinshaw, Lena N., daughter, age 16, born in Kansas; father born in Kansas; mother born in Ohio; attended school. Hinshaw, Arthur E., son, age 14, born in Kansas; father born in Kansas; mother born in Ohio; attended school. Hinshaw, Edwin A., son, age 11, born in Kansas; father born in Kansas; mother born in Ohio; attended school. Hinshaw, Elizabeth, head-of-household, age 60, born in Ohio; parents born in Ohio; married, first married at age 25; owned home; no radio in home; occupation: farmer, general farm. Hinshaw, Birtha, daughter, age 32, born in Kansas; father born in Kansas; mother born in Ohio; single; occupation: saleslady, dry goods. Hinshaw, Edwin A., son, age 22, born in Kansas; father born in Kansas; mother born in Ohio; single; occupation: laborer, construction. Hinshaw, John E., head-of-household, age 67, born in Kansas; father born in North Carolina; mother born in Indiana; married, first married at age 32; occupation: farmer, general farm; not a veteran. 1910 census, Emporia Township (East Side), Lyon County, Kansas; roll T624-445, ED 52, page 199B, line #60, dwelling #168, family #170. 1920 census, Emporia Township, Lyon County, Kansas; roll T625-538, ED 56, page 11A, line #42, dwelling #259, family #264. 1930 census, Emporia Township, Lyon County, Kansas; roll T626-709, ED 18, page 15A, line #19, dwelling #359, family #361. The "Barnesville Enterprise", Sep 12 1895; posted Jan 29 2005 by Cheryl Skinner () to OH-BCGS-L. The "Barnesville Enterprise", Sep 12 1895; posted Jan 29 2005 by Pam () to OHBELMON-L.
1930 census, Emporia Township, Lyon County, Kansas; roll T626-709, ED 18, page 15B, line #58, dwelling #371, family #373.